Brick: Yo! The name’s Brick. (He flexes his left bicep.) And I’m the muscle wall you can never bludgeon. The raven-haired cutie here is my queen, Buttercup, or as I would love to call her, BC or Butterbabe. Buttercup: Yup, that’s my Brickster. The most awesome and coolest hubby I have! Butch: ‘Sup, peeps! The name’s Butch. And you wanna know why my biceps go berserk? (Butch flexes his biceps.) Grrrr…It’s because I got the greatest babe by my side, Blossom or Blossy. Blossom: Oh, Butch, you really are a charmer and an equally great husband. Truly the definition of the strongest and most elegant man I have in my life. Mitch: Waddup! Name’s Mitch. (He flexes his right bicep.) And I’m hard as a rock. My wifey, Bunny Rabbit, can attest to that. Bunny (touching Mitch’s bicep): Why yes. 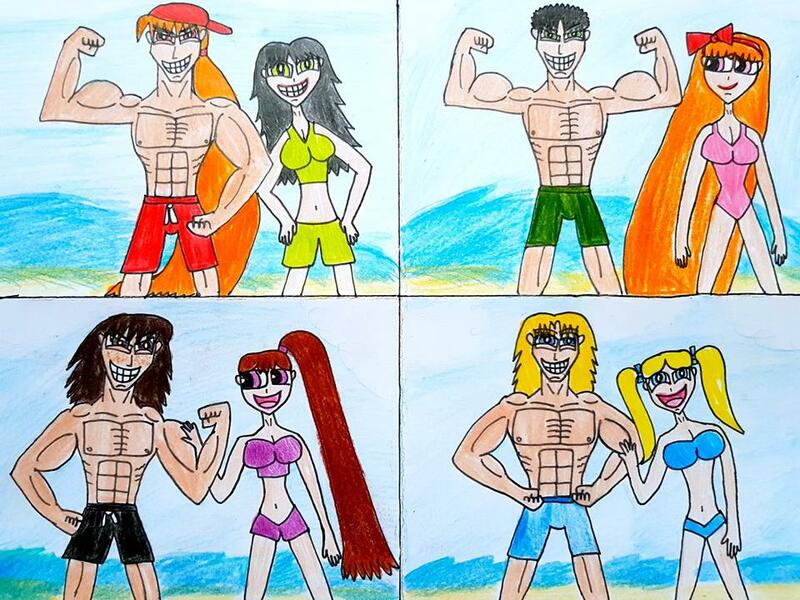 You definitely know how to put those muscles of yours to work, Mitchie. Boomer: Hey! Name’s Boomer. (He flexes his pectoral muscles.) And my pecs go boom boom whenever I see milady, Bubbles, smile. Bubbles: Oh, my handsome Boomie! I’m the luckiest girl in the whole world to have someone like you. Brick, Butch, Mitch, Boomer, Blossom, Buttercup, Bubbles, and Bunny: And we wanna wish you a HAPPY FOURTH OF JULY!!! WOOHOOHOO!!! 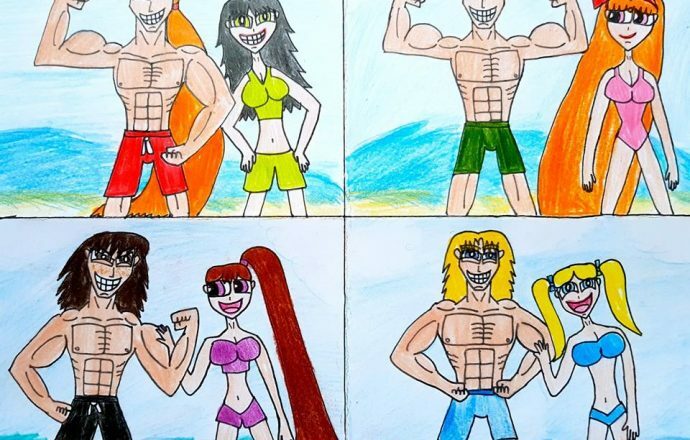 Here we have Townsville’s and in Mitch’s and Bunny’s case Citysville’s all-American heroes having a great time at the beach and enjoying the surf on the Fourth of July. There’s nothing more enjoyable than seeing my most beloved OTPs of all time, Brickercup, Blossutch, Bunnitch, and Boomubbles, looking phenomenal and being the power couples that they are. My main source of inspiration to make this was Soraya7’s Fun in the Sun, which was a piece of work I totally love. I will admit that I am rather envious of how she was able to make Brick, Butch, and Boomer look so hunky and handsome and Blossom, Buttercup, and Bubbles look so gorgeous, and I wish I could make them all as attractive as she did. I really love her work to bits and you should go check it out. After taking a gander at that awesome piece of work, I decided to remix it by giving my piece of fan art not only a summer feel but also something that screams Fourth of July pride though not as blatantly obvious. So, I want to thank Soraya for her great RRB/PPG fanart, I hope she continues to do more of that in the future, and, Soraya, I wish you a most blessed Fourth of July. I would also love to give my warmest Fourth of July greetings to all of the wonderful shippers and fanart specialists of Brickercup, Blossutch, Bunnitch, and Boomubbles. You all know who you are and I am wholly grateful for everything you have contributed so far. May your summer as well as your Fourth of July be splendid and may you celebrate this very special day with joy in your hearts. Brick, Butch, Mitch, Boomer, Blossom, Buttercup, Bubbles, and Bunny from The Powerpuff Girls belong to Craig McCracken and Cartoon Network.